My absence from last year’s ‘polooza means that we haven’t had spaghetti and red sauce since February, so the 125 lbs of seconds from Earth First Farms split between three families is probably, definitely, not enough… but it’ll have to do. 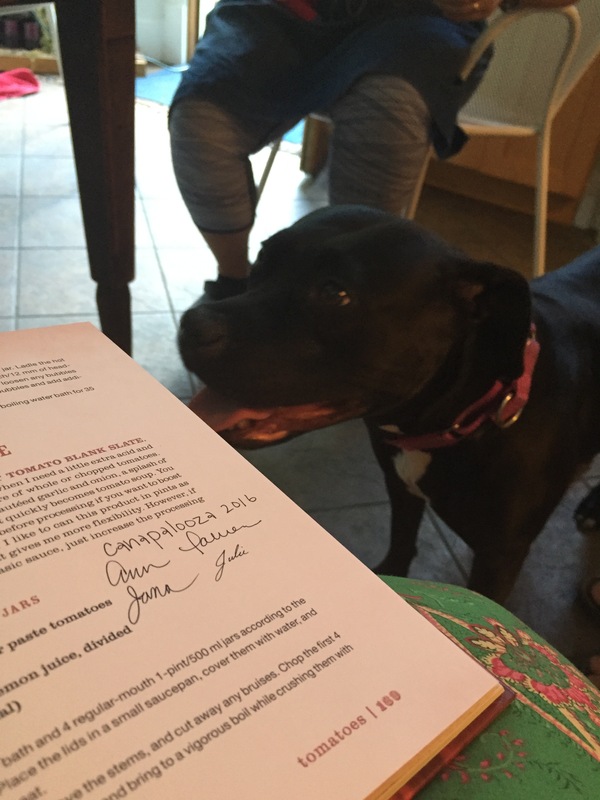 Signing the recipe, per tradition. Mid-processing. Also, Ann has an appropriate tea towel for every occasion. Crush peeled, cored tomatoes into a big (big!) stock pot. We froze our tomatoes ahead of time instead of the blanch-ice bath method. As they thaw they become very easy to peel, plus you aren’t dealing with handling scalding hot fruit. If your tomatoes are super juicy, try and keep some of that out of the pot. 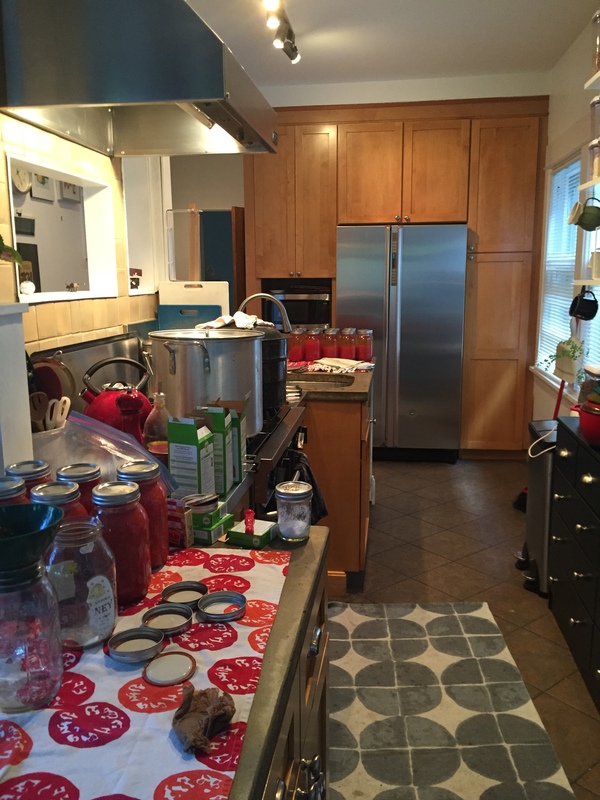 We canned that soupy tomato water to use for adding flavor to rice, pasta, soups, etc. Combine half of the onion, water (it could be tomato water), bay leaves, and half the garlic in a pot and bring to a boil. Reduce heat and simmer for 20 min. Transfer the onion mixture to a blender and add basil, the rest of the onion and garlic. Puree. Add your onion/herb puree to the tomatoes and cook over medium heat. The amount of time really depends on how thick you want your sauce to be – the more time it simmers, the thicker the sauce. This could take anywhere from 30 minutes to several hours. Remove from heat and add salt and sugar. Each pint jar need 1/4 tsp. of citric acid, 1/2 tsp. for quart jars. If using lemon juice, you can use about 1 tsp. for pints and 1 TB for quarts. Seal the jars and heat them in very hot water. If you skip this step, the jars could explode… so don’t. Add sauce to jars, leaving about 1/2-1 inch of head space. Wipe the rim clean, seal the jar, and add to a hot water bath, ensuring that the jars are completely covered with water. Bring the water to a boil, and then set a timer – 35 minutes for pints and 45 minutes for quarts. Remove from the bath and let them cool on the countertop. You should hear a little pop when the jar seals. If any of the jars don’t seal, you can re-process them, or put that sauce in the fridge to use it right away. hmmmm, you mean to tell me i can use the tomato water and skins! I have never thought of this! Do you can or freeze the tomato water? Recipes if you please! I have another 10lbs of home grown tomato’s just waiting!